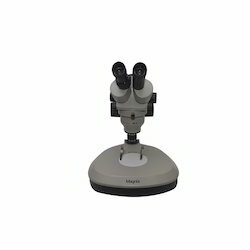 Being one of the trusted firms in the industry, we are highly engaged in providing a unique range of Stereo Microscope. Stand: Dual light heavy duty stable stand with Ball bearing focusing controls. Viewing Bodies: Binocular tube, 45° inclined, 360° rotatable, IPD adjustable 54-74mm. Eyepieces: Wide Field eyepiece WF 10x/18mm focusable paired with eye guards. Nosepiece: Reverse turret with objectives 1x-3x or 2x-4x. 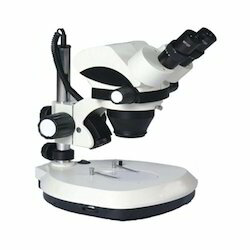 A) Straight Binocular Microscope :- Equipped with one pair of 10x or 15x wide field eye pieces and 3x objective in plywood storing cabinet Magnification 30 x or 45x. B) Straight Binocular Microsocpe :- Same as above, but with trans illumination base. Binocular tube inclined at 45 for comfortable viewing and rotatable through 360. - Observation Head Straight Binocular head with interpupillary adjustment & hand grip. - Stage with clips and reversible black & white plate. - Objectives Fixed Achromatic Objectives 2X or 3X.